Half-way down the Zig Zag path that takes you from the Leas to the Lower Sandgate Road, is a graffito that reads “I hate De Haan”. Is it an art work, part of the Folkestone Triennial; or an act of mindless vandalism; or a considered view of the role of Roger De Haan (heir to the Saga fortune, the millionaire property developer turned philanthropist), in the extraordinary cultural regeneration of the town? 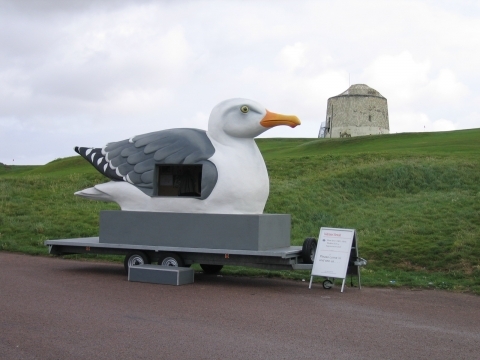 And what, in any case, does it tell us about Folkestone’s first sally into the world of urban, top-down public art? a-n Magazine, for July-August 2008, includes a review section on art in the public realm. [ Folkestone gets a mention but not a review.] In his introduction, Chris Brown the review editor argues that “art generally seeks to disrupt the status quo” and, when it appears outside the gallery, is often rooted in the political, is disorientating and always open to misinterpretation. If public art works are placed at apparent random and without fanfare in an urban environment then these difficulties will be magnified and the validity of any claim to evolutionary, grass-roots origins or local ownership will be tested to breaking point. Her solution, in part, was to come up with art works that reflected the historic and cultural wealth of the town of Folkestone, and established artists – possibly local, so Emin but not Hirst – who could engage with the public, often through collaborative and participatory activities. 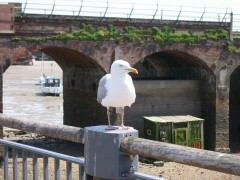 The art was to “fit Folkestone like a glove” and was to offer “something for everyone”. Perhaps, too, she saw the value in marketing the exhibition as celebrity art – so Emin, again! The same edition of a-n Magazine has an article by Lara Farrar on arts criticism in the 21st century, a “nostalgic lament” commemorating “the death of the critic” ( the title of a recent book by Dr Ronan Macdonald and the basis for his article A Triumph of Banality in the Guardian, October 2nd, 2007). 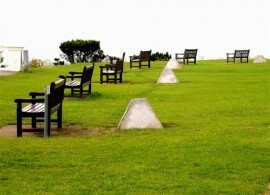 Schlieker is admirably connected to A list celebrities through her earlier curatorial work on such landmark projects as the Angel of the North, and secured coverage on the BBC TV Culture Show as well as the services of local resident Vic Reeves, the epitome of what Brian Sewell has referred to dismissively as “the celebrity as critic”. The exhibition was later repackaged and appeared in the Travel Section of the Guardian along with Whitstable – Hoxton”s sea-side extension! What I imagine was an unexpected and, perhaps, unwelcome bonus came in the form of Bucks Fizz singer Cheryl Baker’s investigation of “up-and-coming” Folkestone, in Channel 4’s A Place in the Sun: Home or Away, when the Kent coast town came out second best – with “crashing predictability” as a TV review rather unkindly put it – to the Cape Verde Islands. With Schlieker’s contacts and curatorial acumen and De Haan’s money and undoubted commitment to the town’s regeneration through culture and the agency of his very own Creative Foundation the Triennial could hardly fail to impact, at least, on the metropolitan elite; but how far would it fulfill its more local objectives. Metro vox might applaud but what about vox pop? The local press was already beginning to show doubts about the overall arts regeneration strategy before the show opened. Kim Dhillon, on artreview.com, quoted the local daily Your Shepway, back in April, with its front page headline “Is the Creative Quarter Over?” and an article questioning the likelihood of success for so many simultaneous creative initiatives. Dhillon also questioned whether or not the locals wanted art. “The worst failure of the Triennial when it opens would be to provoke nothing but ambivalence from the locals”. A tour of the Triennial sites now that the show is up-and-running might suggest a schism between art-goers and the rest. The art works are spread liberally throughout the centre of the town and are not always easy to spot and there were no conspicuous groups of culture-tourists that you could follow from venue to venue, unless you happened to tag on to one of the official tours. Audio guides were available – good ones and on-line – but no one seemed to have one and, anyway, they are an embarrassment to those in-the-know. If you spotted anyone else in pursuit of Tracy’s baby clothes or Mark Dion’s Mobile Gull Appreciation Unit (itself a moving target and when we finally fell over it he had “gone to lunch”), were either familiar from the London train or looked lost or otherwise out of place, like the young man from Bristol writing a review for a Glasgow arts magazine. An encounter with the splendid Kiosk 5-Kite Kiosk, by Norman, Wade and others, a monument to the modernist, aspirational utopianism of the thirties, was not untypical. As an early, local viewer of the piece commented, approvingly, “It looks as if it’s always been there”. Perhaps that’s part of the problem and explains why everyone we saw passed the Kiosk by and looked at us with scarcely disguised bewilderment as a couple of “oldies” bought a kite, emblazoned with the legend Hipsterization Strategies, and proceeded to fly it above the Leas. Near the Kiosk were Boltanski’s Whispers, small metal pyramids on the grass, hiding speakers that broadcast poignant letters written by troops leaving for the Front during the First World War and read by local people. Like the Kiosk, they were scarcely noticed even by those sitting on the adjacent benches. 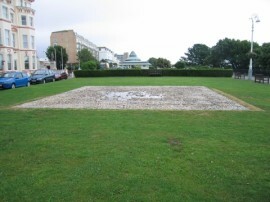 To pause and listen was to appear demented, as was any attempt to view with any degree of attention Mark Wallinger’s 19,420 Folk Stones, laid in the ground further along the Leas, one for each British soldier who was killed on the first day of the Battle of the Somme in 1916. They need sign-posting. They deserve attention but without explanation they seem at best decorative, at worst incomprehensible. Now they are all but invisible, symbolic, perhaps, of troops who serve always in some other, faraway place, out of sight and out of mind. On many levels the exhibition fulfills its objectives – for its references to Folkestone, past and present, for its involvement of local individuals and local clubs and societies- and much of the work is as good as you might expect from a roll call of the 27 artists who have taken part. With twenty-two works, often produced in collaboration, the Triennial merits more than the traditional day trip to the sea-side, even without the added frustration of a Mobile Gull Appreciation Unit and a mobile Sci-Fi library; and Jeremy Deller’s street performances that have neither fixed venues nor times; and the need to catch the tide for a sighting of Robert Kusmirowski’s Foreshore, a reconstructed fish market sited, literally, in the harbour. For a well-planned campaign, go first to the Information Centre in Tontine Street – opposite and neon-lit by Heaven is a Place Where Nothing Ever Happens by Nathan Coley, risk the ignominy of an audio guide and don’t worry about local reactions. No-one will notice. Freelance writer on art matters - especially relating to art in the environment - natural and built, political and socio-economic.